Has the gravity of your current situation dawned on you yet? You are literally carrying the future in your belly. Every choice you make from nursing to the type of mobile you choose will be scrutinized by loved ones and complete strangers. So before you run to the parenting aisle of your local bookstore in response to the latest piece of unsolicited advice… Lighten Up! Pregnancy is what you choose to make of it. Instead of getting tense and worried with each new phase of your “condition,” take these tips on how to make light of being pregnant with funny and custom maternity t-shirts. You know you laughed! This is part of the fun of being pregnant. Whether this event was preplanned, or a big surprise, it is all part of the story you will tell your future child. Pictures of pregnant mom in her funny and custom maternity t-shirts can make great Christmas cards or additions to the baby’s scrapbook. By choosing witty sayings for your maternity t-shirt, you will create immediate connections with people who appreciate our sense of humor. Whether your personal sense of humor leans towards, “Never Mess with a Pregnant Woman” or “Are We There Yet?” you will be able to find funny maternity t-shirts to make you laugh out loud. 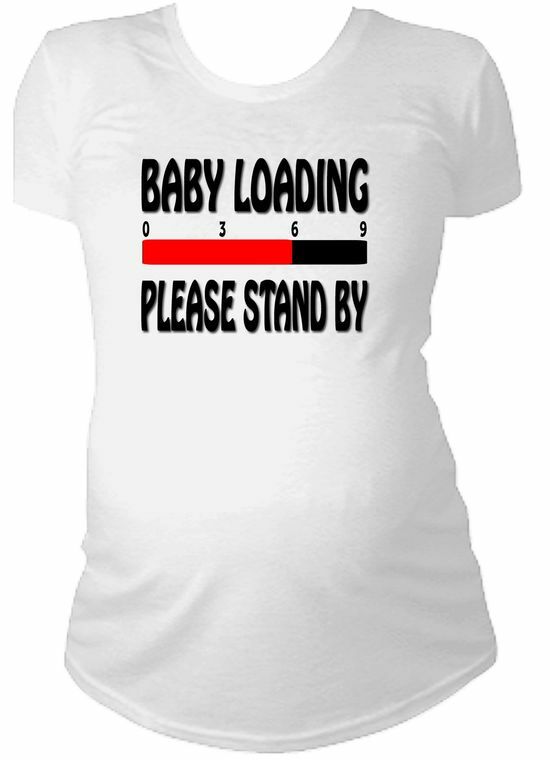 Custom maternity t-shirts are also a great way to express your personal beliefs and convictions. Religious sayings like “Designed by God” may be the perfect expression of your faith. Or politically charged ones like “Already Better than Bush” might work if you rather enjoy pushing people’s buttons. Just because you’re pregnant doesn’t mean you give up your personality. If “Don’t Touch” or “Yes, I’m Pregnant” will save you from the unsolicited belly rubs and silly stares of strangers, well who could really ask for more in a piece of clothing? What about “Not Finding Out”? That could really save you from about a hundred questions a day. Keeping things on the lighter note you may want a maternity t-shirt that says “Under Construction” or “Belly Dancer.” Once you start looking around, it’s easy to see how to make light of being pregnant by wearing funny or custom maternity t-shirts. I know, you weren’t thinking of buying a funny or custom maternity t-shirt for Dad, but why not? After all, who got you into this situation? He should definitely share in the joy with a t-shirt that reads “Sympathy Belly” or “Look What I Did” with an arrow pointing toward you. This is a fun time for the two of you, and you will need your sense of humor in the months ahead as you navigate sleepless nights and a fussy baby. You can even get custom shirts for the older siblings, grandparents, aunts, or uncles. This is a great way to make brothers and sisters feel important, and other relatives feel connected to the baby. Ultimately, the key in how to make light of pregnancy outwardly with a custom or witty maternity t-shirt lies in your personality. This is a great time in your life, so don’t spend too much time obsessing over the right diaper and try to have fun.